In August 1941 the Canadian government awarded a near $10 million contract to McNamara Construction Company of Montreal for the construction of Goose Bay Airfield. The date of completion of the contract was in 1943. However, the runways were completed in six months, as well as some of the buildings for the Royal Canadian Air Force. The first of many ships carrying base construction materials to Goose arrived on 17 September 1941. Most of the materials on board were for the first dock at Terrington Basin. As more materials and heavy equipment arrived, work began on the northeast part of the airfield site. The land was cleared in a record six weeks and two snow-rolled runways were quickly placed into service for the winter of 1941-42. The first American plane to land at Goose, on 6 November 1941, was a USAAF mail and freighter aircraft. The very first civilian aircraft to arrive was a ski-equipped Quebec Airways plane on 3 December 1941. It was apparent that when the snow started to melt the two snow-rolled runways would be out of service, so a third runway was started. This one covered with brush so the frost would not fully penetrate the soil. In the spring of 1942, when the brush was removed, the runway was immediately placed in service. During the spring and summer of 1942 over 623,000 square yards of concrete six inches deep was laid on the two 3,000 feet runways. This, along with temporary buildings, a large concrete gasoline storage tank, warehouses, and a number of intercommunity roads on the base site made Goose Bay operational for the Ferry Command by late 1942. The attention of the world turned to the Pacific on 7 December 1941, when the Japanese attacked Pearl Harbor. The United States immediately began to set up the USAAF Eighth Air Force in Britain. The need was now much greater for bombers and fighters to be flown across the Atlantic. Gander was overcrowded with the number of assigned and transient personnel. The United States began to look upon Goose Bay as the answer to its requirement for an alternate airfield and space to perform. By 7 December 1941 the RCAF already had a strength of over 3,000 personnel at Goose. An agreement was reached with the Permanent Joint Defence Board to allow the United States to build a base at Goose Bay on the southeast side of the airfield. In January 1949 a further step was made towards the unification of the old northeast bases. A direct communications system was established between Goose and Pepperrell AB, Newfoundland. Previously, any communications between these stations had to be sent through Ernest Harmon AFB. This action was accomplished at the right moment for, in October 1950, the old Newfoundland Base Command was inactivated with the Northeast Air Command (NEAC) being activated at Pepperrell. Along with the activation of NEAC, the 6603rd Air Base Wing was activated at Goose and the installation became an integral part of the regional defense system. By this time the Strategic Air Command was being supported by Goose. Another reorganizational change occurred during 1952. Headquarters NEAC redesignated the 6603rd Air Base Wing as an air base group commensurate with other such organizations throughout the command. During this time Goose actively supported SAC operations, and in July 1952 initiated project SEAWEED. The first jet aircraft assigned to Goose were F-94B of the 59th Fighter Interceptor Squadron, on 3 November 1952. The 59th Fighter Interceptor Squadron was activated at Goose in January 1953 to provide fighter protection of this base. This unit was originally on an indefinite duty tour, but this eventually lasted until January 1967 when the 27th FIS assumed the duties of the 59th FIS. Besides this, Goose also received control of Frobisher Bay from NEAC. This occurred 12 June 1953. In October a companion unit from the 59th FIS was activated at the Goose: the 22nd Helicopter Squadron was assigned H-19A and H-19B helicopters. During the first half of 1954 the construction program curtailed because of the Korean War, again commenced at Goose. The airfield was repaved. Nine aircraft hangars, four concrete warehouses, the steam power and heating plants, navigational-aid facilities, two fire stations, a heated motor vehicle garage, and several shop buildings were constructed. Work began on the chapel, theatre, PX, new base operations building, and headquarters building. Goose was again affected by reorganization when NEAC deactivated the 6603rd Air Base Group and organized the 6606th Air Base Wing. The base was not only required to support aircraft, but to participate in scientific research and exploration projects. The base was called upon to give local support to scientific parties in Labrador for recording the solar eclipse of 30 June 1954. The support given by the base aided immeasurably to a better understanding of eclipses and sun itself. In 1956 several changes occurred that affected the organizational structure of Goose again. During the first half of the year Goose received District 3, Office of Special Investigations, and the 5th Weather Group’s Detachment 4. Toward the end of December plans were announced for the reorganization of the northeast area. Subsequent changes gave Goose the added responsibility to support the 59th FIS, the 920th, 922nd, 923rd, 924th, and 936th Aircraft Control and Warning (AC&W) sites, in addition to certain early warning gap-filler stations along the Labrador and Newfoundland coasts. Goose was also required to support Detachments 4 and 7 of the Air Postal Squadron and detachments of the radio relay squadrons. Headquarters Strategic Air Command (SAC) designated Goose a Category One installation on 9 January 1957 with the base giving top priority support to SAC operations. The Northeast Air Command, in existence for seven years, was deactivated 1 April 1957. All its bases were divided between SAC and ADC. Then, on this date, the 6606th Air Base Wing was deactivated and a strategic wing, destined to outlive any other unit at Goose, was formed; this was the 4082nd Strategic Wing that would live through the end of the propeller-driven alert aircraft and into the jet age. At the time that SAC took over Goose, there were 3,300 military personnel and over 700 civilians working on the American side of the base. The KC-97 refuelling tanker aircraft used Goose for many of the Squadron’s operations. The new B-47 Bomber began its early flights from Goose to overseas destinations. The flight crew participated in many projects to determine the capability of both aircraft and aircrews to function under severe climatic extremes. Work was completed on the new dental clinic, commissary, dependent’s elementary school and an NCO open mess. Construction began on a new civilian dining hall, airman’s dining hall (Herbert Hall), a new electrical power plant and heating plant. The "Goose Hilton", the highest building in Labrador, and dormitory for 500 men, was completed and occupied in November 1959. The year ended with an award of a contract for new alert facilities for the Fighter Interceptor jet crews. The history of Goose indicates that after the war years, the base alternated among periods of relative calm, reorganization and construction programs. By November 1958, the USAF relinquished control of Frobisher Bay to the RCAF. A new working agreement was signed in June 1958 with the Canadian Department of Transport handling the logistical requirements formerly furnished by the USAF. Airdrome improvements resulted in safer environments for the refuelling operators of the KC-97 propeller-driven aircraft. Projects were completed to light the ramp for taxiing and maneuvering of large numbers of aircraft at night. Seeding and planting of grass to prevent severe dust storms during the summer was a major undertaking. Goose turned green in the summer of 1959. On 1 January 1959 the Strategic Air Command at Goose came under the jurisdiction of the 45th Air Division at Loring AFB in Maine. In May 1959 the exclusive "Icebreaker" Service Club was completed. On 12 April 1960 the first KC-135 jet tactical tanker arrived at Goose. This unit was followed by many more that were stationed on the base for over six months. In 1960-61 the 54th Air Rescue Squadron was activated at Goose Bay. At the close of the shipping season all the remaining US Army Transportation Unit members withdrew from operating the Port of Goose Bay. The Army Unit was first assigned back in the early fifties. Both the USAF and the Canadian Department of Transport (DOT) came to a working agreement for the operation of the port facilities. DOT agreed to handle the continuity of civilian personnel to unload ships while the USAF furnished certain support services. In October 1962 the USAF began a $350,000 project of redredging the two channels which allows ships of 35 feet draught to enter Goose Bay. A more significant organizational change took place on 1 July 1960 when the KC-97 Goose Tanker Force was assigned to Sondrestrom Air Force Base in Greenland. Several KC-97 refuelling tankers were placed on alert there. The object of stationing the KC-97’s there was that they did not have the range of the new KC-135 jet tankers. In October 1965 Goose Bay went down in history once again when the 4082 Strategic Wing supported the historic Operation "Big Lift", in which an entire US Army Division and its support units were deployed to Central Europe. Goose supported 19 C-133 and 48 C-124 aircraft staging through the base on 22 October 1963. In 1966 when Ernest Harmon Air Force Base closed, Goose AFB assumed many of the functions previously performed by Harmon. 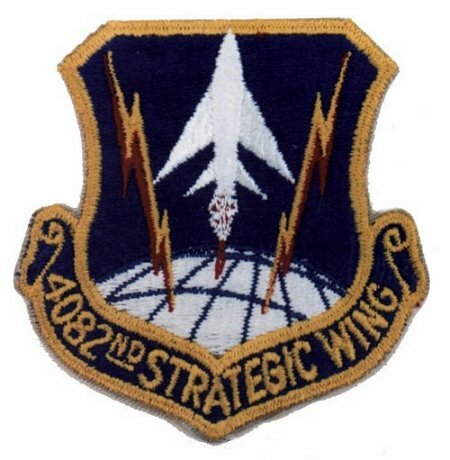 Towards the end of 1966, the 4082 Strategic Wing was deactivated and it became the 95th Strategic Wing. Many Air Force Bases in the United States and overseas closed in 1966, however, the strategic importance of Goose Air Base was still top on the list in Washington DC. The Fighter Interceptor Squadron was transferred to a new base in the States. New, modern, large aircraft were assigned to Goose, like the B-58, C-07, HU-16 and U1A. Although many USAF units were assigned to Goose Air Base over the years, change in organization, mission and support were the keys to the history of the base. Goose Air Base continued to prosper for the next ten years. The RCAF had a small number of personnel on their side of the base and, on 1 August 1967, they turned over all their operations to the Canadian Department of Transport. Some RCAF personnel remained to operate Radar and Traffic Control, as under the original US/Canadian agreement covering the USAF presence in Goose, this function on the base had to come under Canadian Military command. In 1971 the Canadian Forces Base on the north side of Goose phased out. All buildings were turned over to the Province of Newfoundland. The remaining RCAF and RAF moved over to the American side. A small continent of RCAF personnel took over the operation control on 12 July 1971 of the NORAD Control Center and the Long Range Radar Station at Melville, Goose Bay. In 1973 the 20-year lease, signed in 1953, was extended for six months. In July of that year the land, buildings and improvements of the USAF were turned over to Transport Canada, and a new agreement was signed to provide services and facilities to the USAF until 1 July 1976. On that date the Canadian Department of Public Works assumed responsibility from the Canadian Department of Transport for maintaining roads, operating the heating plant and providing snow removal, water service, fire-fighting, and other miscellaneous services. The DOT continued to operate the airport. USAF Headquarters in Washington DC announced the deactivation of the 95th Strategic Wing at Goose Bay in September 1976 and that their active involvement in the use of Goose Air Base would cease. The final closing was on 1 October 1976. A few USAF personnel have remained at Goose since that time to look after the interests of any US military aircraft stopping over for service. The net worth of the American side of the base, including land improvements over the years, is estimated at over 250 million dollars. Assorted photos of Goose Bay - 2001. Assorted crests from Goose Bay - USAF, RCAF, RAF. Assorted photos of Goose Bay - 1992. Assorted photos of Goose Bay - 1983. Assorted photos of Goose Bay - 1966. Assorted photos of Goose Bay - 1958. Assorted photos of Goose Bay - 1952.